The Centre for Human Rights and Legal Pluralism hosted O’Brien Fellows in Residence seminar with Professor Laurens van Apeldoorn (Leiden U., The Netherlands), in collaboration with the H. Heward Stikeman Chair in the Law of Taxation. What is the impact of exploitation in the supply chains of multi-national enterprises on the appropriate allocation of corporate income tax revenue to jurisdictions where these enterprises are active? This presentation will develop a concept of exploitation based on the violation of the right to a living wage, put this in the context of discussions of transfer mispricing in multinational enterprises, and consider the economic dimension of the allocation of corporate income tax revenue in relation to public goods provision in low-income countries where exploitation occurs. 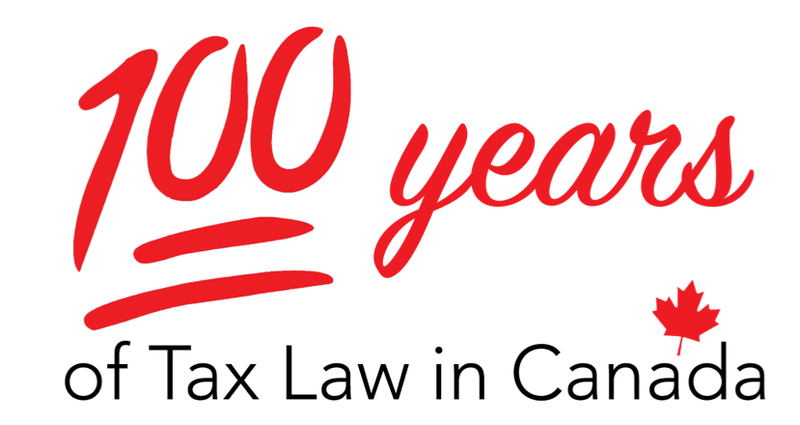 2017 marked the centennial of Canada's federal income tax, so it is appropriate that this year’s tax policy colloquium at McGill Law will focus on the theme of 100 Years of Tax Law in Canada. The colloquium was made possible by a grant from Spiegel Sohmer. The land on which we gather is the traditional territory of the Kanien’keha:ka (Mohawk), a place which has long served as a site of meeting and exchange amongst nations. December 5, 2017 (14h30-17h30, NCDH 101): Professor Kim Brooks, Schulich School of Law, will give a talk on "Comparative Tax Law: Development of the Discipline." The new millennium has inspired renewed interest in comparative law generally and comparative tax law in particular. However, the contours of the theoretical and methodological debates lack definition; despite several leading articles that call on scholars to actively engage with each other on matters of approach, most scholars continue to “write alone”; and despite the increasing availability of thoughtful comparative law textbooks and monographs, tax scholars do not connect their work with debates in comparative law generally. 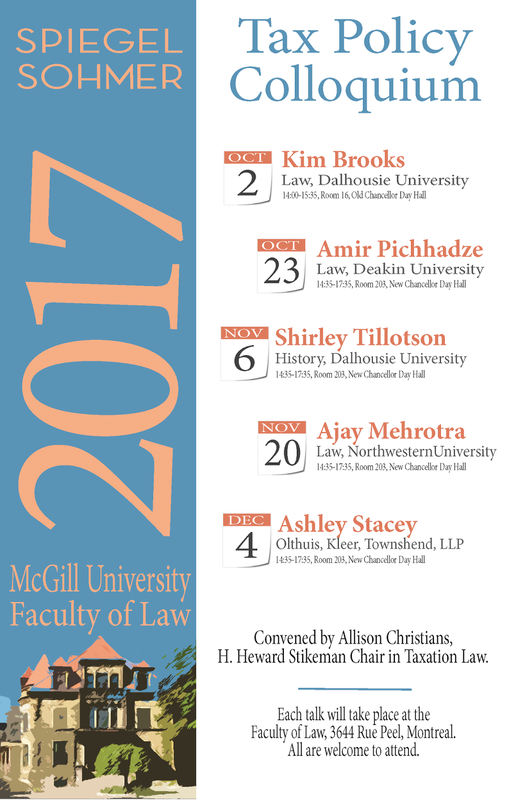 December 4, 2017 (14h30-17h30, NCDH 203): Ashley Stacey, Associate, Olthuis Kleer Townshend. Ms. Stacey is a junior associate whose practice is focused on advising First Nations and First Nation-owned businesses on corporate and commercial transactions and who blogs at oktlaw.com on tax and governance issues relevant to First Nations communities. Ms. Stacey will present her work in progress on historical and contemporary intersections of taxation, sovereignty, and autonomy of First Nations in Canada. November 20, 2017 (14h30-17h30, NCDH 203): Ajay Mehrotra, Executive Director and Research Professor, American Bar Foundation, and Professor of Law, Northwestern University. Professor Mehrotra is a leading voice on tax history in North America who has studied various aspects of interrelationships and influences in Canadian and U.S. tax law history. 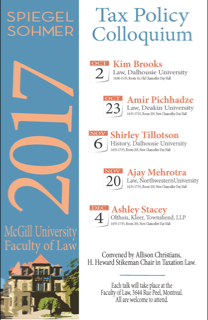 Mr Mehrotra will present a work in progress on intersecting developments in Canadian and U.S. tax law history. October 23, 2017 (14h30-17h30, NCDH 203): Amir Pichhadze, Lecturer, Deakin University, Australia. Prof. Pichhadze is an emerging scholar who studied comparative tax law in the U.S. and U.K. and completed a Judicial Clerkship at the Tax Court of Canada. 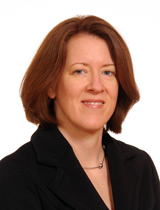 He will present work in progress on the development of value added taxes in Canada, the U.K., and the U.S.
November 6, 2017 (14h30-17h30, NCDH 203): Shirley Tillotson, Professor of History, Dalhousie University, is a recognized expert in Canadian tax law history who has written multiple articles and books on the subject. Professor Tillotson will discuss her new book, Give and Take: The Citizen-Taxpayer and the Rise of Canadian Democracy, and her upcoming research plans. The year 2017 marked the 100th anniversary of Canada’s federal income tax. In commemoration of this milestone, the Stikeman Chair in Tax Law held a half-day symposium in conjunction with the Spiegel Sohmer Colloquium. The goal of the event was to explore the evolution of tax law and policy in Canada over the past century, as taxation experts conferred on some of the key themes of tax law and policy development in Canada in two roundtable discussions and a retrospective. The event concluded with with a cocktail reception - and a spectacular cake - to celebrate 100 years of federal income tax in Canada. 14:00 Spiegel Sohmer Colloquium Keynote. 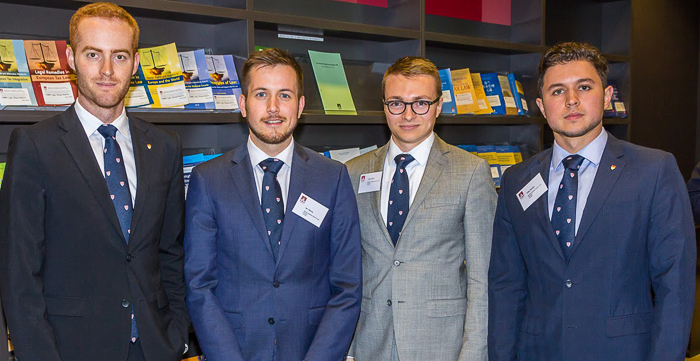 Students Daniel Stysis, Ian Attema, Jacob Heyka, and Oleg Stratiev (pictured above, sporting spiffy McGill ties) represented McGill during the International Bureau for Fiscal Documentation (IBFD) Global Tax Treaty Commentary moot taking place at the University of Cape Town in May 2017. The team competed against over 20 other teams, beating out the US, France, UK, Germany, and Russia. The team wishes to thank coaches Allison Christians and Robert Raizenne.